It’s been about a year since I began my curly hair journey (read here) and through my journey I have tried many different hair products, some that I’ve loved, and some my hair has disliked. Through it all, these products have been my go-to products. I find myself purchasing them again and again, and even collecting them when I see they’re on sale, haha! Who’s with me? I mean, who doesn’t like to find their favorite products on sale? This shampoo lathers really well and a little goes a long way for me. I have tried other shampoos but find myself coming back to this. It really leaves my hair soft, silky, and smelling uhmaaazing. The best part? Sulfate-Free! This conditioner really lives up to its name, curl hydration. I love love love it, and can we discuss the price? -$6 for such a big bottle, that’s a steal! My favorite part is how easily I can run my fingers through my hair when I finger comb it in the shower. You may just wake up like Yonce, Flawless. As soon as I get out of the shower, I apply my hair products in the order you see above. I need all four products for my hair to look its best, seriously, otherwise you’ll see me in a high bun. 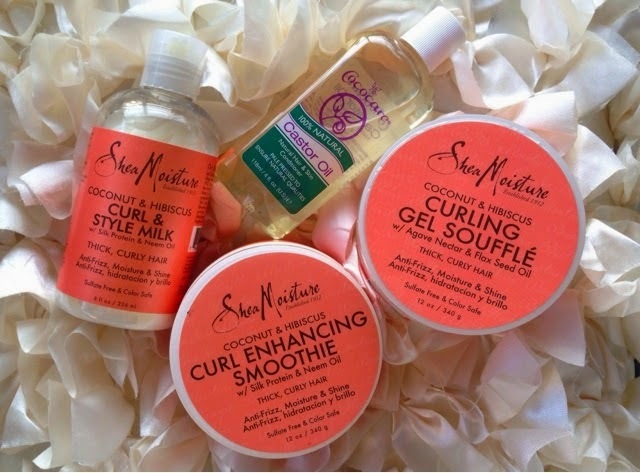 I apply the Curl & Style Milk + Curl Enhancing Smoothie evenly throughout my hair. As for the Castor oil (purchased at Walgreens) I apply to my ends to seal in moisture. Lastly, I apply the Curling Gel Soufflé. I avoid putting any of this product on the top half of my hair because it can get a little too greasy. I use a tad bit (like a quarter size) of this for that reason. I finish with diffusing my hair on low heat! I don’t want to get too much into detail with the process I go through (that’ll be another blog post) so just stay tuned! I find that just a bit of the curling gel souffle goes a long way. I am going to try the Deva curl coconut cream styler soon!